March is National Nutrition Month and this year’s theme is EAT RIGHT. What better time to start eating more fruits and vegetables! Get your kids involved in the grocery shopping! Allow them to pick out the fruits and vegetables they’d like to try. Sneak in the Fs and Vs. Add to yogurt, stir-frys, pancake mixes, casseroles, or anything else you can think of! Serve in easy-to-eat ways, such as veggies with hummus or ranch dip or fruit smoothies. 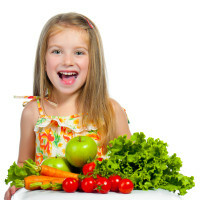 For more tips, read this Super Kids Nutrition article!